"Skyscraper" may be Dwayne "The Rock" Johnson's next blockbuster hit at the box office. One of Hollywood's most dependable franchises has a new film opening this weekend. That franchise? Dwayne "The Rock" Johnson. "Skyscraper," Johnson's latest film, in which the action star scales the tallest building in the world to save his family, is expected to have a $30 million US opening, according to analysts. That's a solid opening considering "Skyscraper" isn't a sequel, a prequel, a reboot or a part of any franchise. "Skyscaper's" draw isn't that it's the next film in a connected cinematic universe or a sequel that comes after years of nostalgia. Its main draw is Johnson, playing his latest hero in a series of action movies. For decades, it was the norm in Hollywood for movie stars to carry films at the box office on their names alone, such as Arnold Schwarzenegger in "Total Recall" or Jim Carrey in "Liar, Liar." There are still actors who can reliably get people to buy tickets, but the most bankable names in Hollywood these days are Tony Stark and Luke Skywalker, rather than Tom Cruise and Jennifer Lawrence. Johnson, the WWE wrestler turned actor, stands out in an industry dominated by franchises by becoming a franchise himself. "His name above the title is usually a guarantee of success no matter the genre," said Paul Dergarabedian, senior media analyst at comScore (SCOR). "In a world where concept is king and stars are merely cogs in the wheel, Johnson is the wheel." Since his debut in 2001's "The Mummy Returns," Johnson's films have made nearly $10 billion globally, $3.5 billion of which was made domestically. The actor's success in some ways mirrors that of Schwarzenegger, another larger-than-life figure who crossed over from sports to acting. Schwarzenegger's movies have raked in $3.7 billion domestically when accounting for inflation, but Johnson's career is still peaking and he has the benefit of making money from more international box offices. Johnson's repertoire includes franchise films ("Furious 7"), disaster films ("San Andreas"), animation ("Moana") and comedies ("Central Intelligence"). Nine of his last ten films opened at either No. 1 or No. 2 at the box office. "I guess it's my love letter to those movies," Thurber said. It's more than just movies, too. Johnson, who did not respond to CNN's request for comment for this story, is the executive producer and star of HBO's comedy "Ballers." He has a partnership with Under Armour and he runs his own production company Seven Bucks Productions, which he co-founded with his ex-wife Dany Garcia (Johnson says he named it "Seven Bucks" because he had only $7 in his pocket in 1995). Johnson has 110 million followers on Instagram and has reportedly made $124 million in acting earnings in the past year. Johnson, not unlike Marvel or "Star Wars," has become an ever-present brand that transcends film. Jeff Smith, a film professor at the University of Wisconsin-Madison, believes that one reason Johnson is so popular is because he "projects a degree of sincerity that you don't always get from action heroes" and despite his size and strength, Johnson has an everyman appeal. "Look at 'Skyscraper,' just from the previews you can see that trying to save his wife and child is big part of his motivation," he said. "He's not a superhero, even though he's obviously capable of doing pretty extraordinary things onscreen." Johnson's box office power is apparent internationally as well. 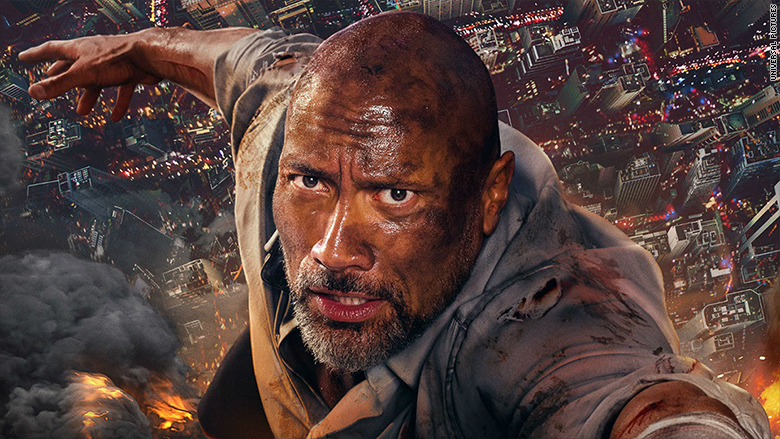 More than $6.4 billion of his nearly $10 billion box office total comes from overseas with his last film, "Rampage," bringing in 76.7% of its grosses from international markets. "Johnson's global fan base is hard to overstate," said Shawn Robbins, chief analyst at BoxOffice.com. "His appeal isn't limited to men or women, young or old, US or overseas. He has a gift for developing projects that transcend cultural boundaries." Johnson's penchant for blockbusters may not be flagging anytime soon. Disney's "Jungle Cruise," the "Fast and the Furious" spinoff "Hobbes and Shaw" and the sequel to "Jumanji: Welcome to the Jungle" are all slated for 2019. So is Johnson -- to borrow a Schwarzenegger movie title -- Hollywood's last action hero? "I don't think he'll be the last, but he's certainly the standard-bearer right now," Robbins said. "If he can be a franchise unto himself in today's pop culture climate, then it's possible for others to adapt and do it again in the future."